Super Peak Electrons - D.M. Autotrophs(auto=self,troph=energy) take in various matirials(i.e. sunlight) and make it into energy. 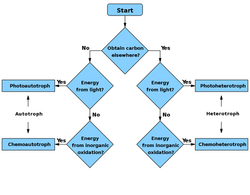 Photoautotrophs(photo=light) are usually plantlife. they use clorophyll to absorb sunlight and then use it to make carbon. Chemoautotrophs(chemo=chemical) oxidise local electron donors to generate 02. There are plenty of autotrophs found growing on your bread, sprouting in your garden, being put in your burgers, and more!